Yesterday, a 40-year-old Kevin Garnett announced his retirement from professional basketball. Garnett, simply put, is the reason why I started playing basketball and loving the game. It is hard to express how much "The Big Ticket" means for me. Basketball is today such an important part of my life. For me, it´s not only a game that I enjoy playing and watching, but also a passion, a discipline at which I try to get better every single day, by playing it, watching it, analyzing it and, all in all, living it. Kevin Garnett, in my opinion the greatest and most passionate power-forward to ever play the game, provided a perfect example of how we should confront life and the diverse obstacles we can encounter throughout our experiences. Always wanting more, always going hard at his defenders, always taking pride in his hard work, KG is such an important role model for me. He was the first player to be drafted straight out of high school to the NBA in 20 years. Being a power forward, this was an extremely risky decision to make. Garnett, who was a high school sensation but also a skinny, "what-if", undeveloped player, went all in to fulfill his dream and play against the biggest, strongest and most dominant big players in the world. Later in his career, he proved that he was the best player to be drafted in that 1995 draft class. But it was not easy. His success came after hard-fought years of struggle and frustration, in which he didn´t see his Minnesota Timberwolves make significant progress or be competitive in the NBA. 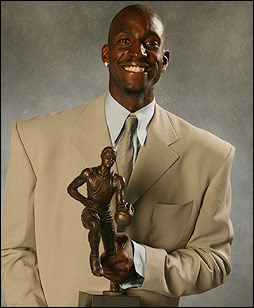 KG became the MVP in the 2003-2004 season thanks to his overwhelming dominance over any other player in the NBA. A monster at the rim, he could dunk, rebound and assist like nobody could. His mid-range shot was unstoppable. His footwork, a pleasure to watch. But even at the top of his individual career, he didn´t manage to make it to the final stage, the NBA Finals, as he was defeated in the Western Conference Finals by the Lakers, the team he happened to be a huge fan of as a kid in Mauldin, South Carolina, where he was born. Magic Johnson was his idol. Right before Garnett made his All Star debut in 1997 in Cleveland, Magic high-fived him and told him: "enjoy the game man, enjoy yourself". 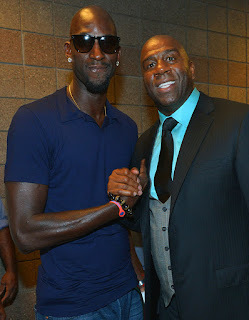 KG then turned to the camera following him, and said: "I´m not gonna wash this hand for a long time". After the departure of Latrell Sprewell and Sam Cassell, KG´s two best teammates in Minnesota, Garnett played extraordinarily through two more collectively mediocre seasons in which the Timberwolves didn´t even make the Playoffs. It was time for change. And boy, what a change. The Celtics signed Garnett to form one of the greatest trios in basketball history with Paul Pierce and Ray Allen. 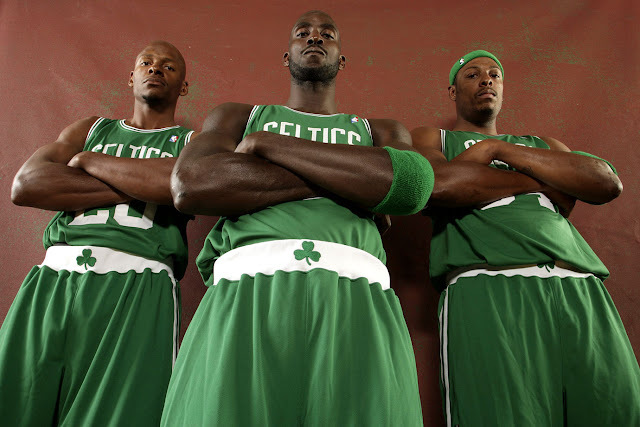 The 2007-2008 Celtics looked scary. And they actually were. The team completed the biggest win percentage turnaround in one season in NBA history: from 24 wins and 58 losses in 2006-2007, to 66 wins and 16 losses in 2007-2008. After a historic season, the Celtics were in the NBA Finals for the first time since 1987. In front of them, guess who? Yes, the Lakers. But this time it was going to be different. In a video recently released by the NBA YouTube channel, KG says "I picked my head up, and I took a blink, and I blinked again, and I see the Lakers right in front on me. And I got a patch on that says "NBA Finals". And I just remember seeing Larry Bird on this side and James Worthy and Magic on this side, and it´s about to go down. The crowd before the game was like a jamboree, man. I was like, wow, I´m in the Lakers-Celtics series, for all the marbles." 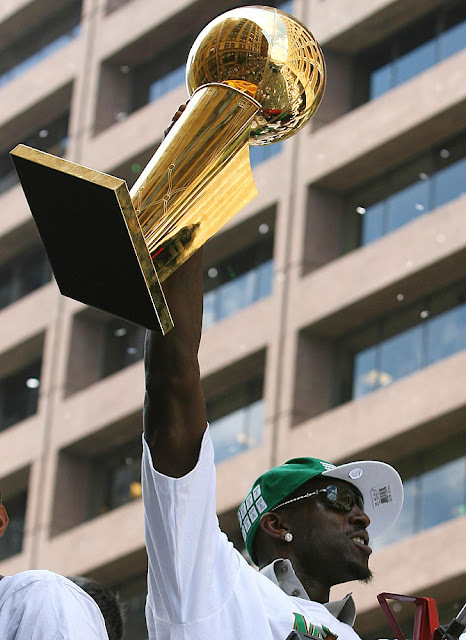 Garnett´s great storytelling skills were showing us that the Celtics were going to be NBA champions. And it happened. After a memorable six-game series which Kobe Bryant often considers the most frustrating defeat of his career, the Celtics won the trophy at home, in front of the same fans that had watched them struggle for years. "ANYTHING IS POSSIBLE!" was KG´s historic celebration motto. 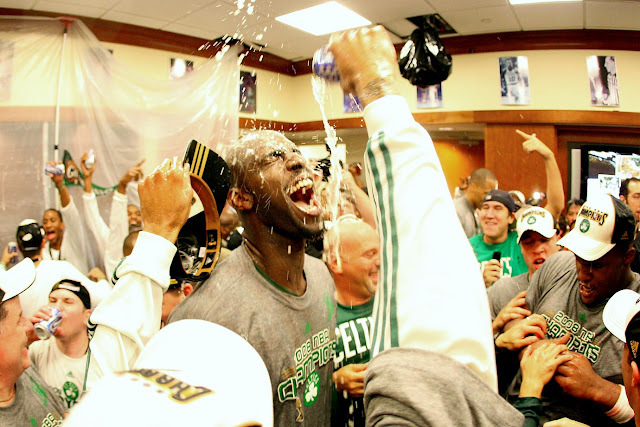 A second straight NBA championship escaped the Celtics´ trophy room two years after, in 2010, when they lost by 4 points in game 7 against the Lakers blowing a 3-2 lead. After a couple more seasons, Garnett and Pierce sacrificed their status for the Celtics organization, who needed to start rebuilding for the future, and traded them to the Nets in a sad but necessary move. After Garnett injured his knee in 2009, he was never the same player. His intensity and charisma remain untouched, but he had to see most of the games from the bench as his body was starting to show the consequences of playing in the NBA since he was 18. In 2015, he went from Brooklyn to Minnesota, to the team who drafted him, to the place where his legend started. In a young, talented team, Garnett didn´t enjoy many minutes on the court, but he established himself as a leader in the locker room, as a mentor for a promising group of players. Being an MVP and a Defensive Player of the Year, the development of the young players and the success of the team as a whole was all he cared about. Yesterday, September 23rd, 2016, Kevin Maurice Garnett´s retirement was made official. Yesterday, we said goodbye to a legend. Apart from his outstanding basketball skills, I don´t think we´ll ever see a player who carries himself with the passion and energy that KG does. The game will miss him. Thank you for being the reason I started playing and loving basketball. Thank you for what you brought to the game. Thank you for your passion, your drive, your energy, your persistence. Thank you for all those epic buzzer-beaters, putback dunks and magic assists. Thank you for embodying Celtic pride. Thank you for teaching and showing us that anything is possible.